Oct. 13, 2016 – San Diego, CA — A class action lawsuit against the makers of the fertility drug Bravelle survived the manufacturer’s attempt to quash it last month. Plaintiffs in the case now have until Oct. 18 to file a 2nd amended suit. In Illinois federal court, U.S. District Judge Amy J. St. Eve denied in part Ferring Pharmaceutical’s April 22 motion to dismiss the class action suit, brought in response to the company’s 2015 recall of certain batches of Bravelle due to potency issues. The present lawsuit was filed on March 9, 2016 by six plaintiffs in four states — Illinois, Michigan, South Dakota and Texas — on behalf of themselves and all others similarly situated. In her Sept. 27 order, Judge St. Eve denied Ferring’s motion to dismiss claims of breach of express warranty, breach of implied warranty, unjust enrichment, three counts of consumer protection act violations, as well as claims the company violated the Magnuson-Moss Warranty Act. Judge St. Eve granted in part Ferring’s motions to dismiss claims of express warranty under Illinois and Michigan law, and unjust enrichment claims under Texas law. Two other claims, including breach of implied warranty under Illinois law and violations of the Michigan Consumer Protection Act, were dismissed voluntarily by plaintiffs. Ferring’s motion to strike the class action suit was also dismissed by the judge, who said it would be premature to strike the class allegations at such an early stage. Ferring attempted to get the class action suit thrown out by arguing the plaintiffs did not sufficiently allege that all recalled batches of Bravelle were actually sub-potent. It also argued plaintiffs did not sufficiently allege the Bravelle they bought personally were sub-potent. Judge St. Eve cut down those arguments in her order, saying Ferring’s voluntary recall of certain batches was enough for plaintiffs to plausible allege that all batches could be sub-potent. The judge also said it was not within plaintiffs’ knowledge to know whether or not those batches were potentially sub-potent. 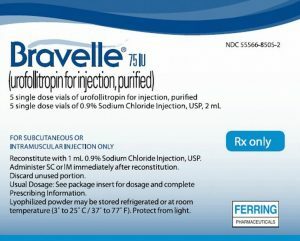 Bravelle is a fertility drug containing the hormone FSH and works by stimulating egg production in women who are able to produce and release eggs. It is often used as part of a fertility treatment cycle, such as in vitro fertilization and artificial insemination. On Oct. 13, 2015, Ferring recalled all batches of the drug produced between March 2014 and October 2015 because tests showed certain batches of the drug did not meet potency standards and contained less of the hormone FSH than is necessary to stimulate egg production. The 8-count class action lawsuit brought by plaintiffs alleges Ferring Pharmaceuticals failed to ensure the recalled lots of Bravelle were effective before selling them to patients, and plaintiffs are seeking relief for all out-of-pocket expenses related to their fertility treatments. At this time, Ferring has agreed to refund out-of-pocket costs for Bravelle only. Plaintiffs in the lawsuit claim they spent anywhere from $7,000 to $35,000 for fertility treatment cycles that were rendered ineffective because of the use of the sub-potent batches of Bravelle. Plaintiffs say they are now unable to continue fertility treatment due to the significant costs. Judge St. Eve’s September order gives plaintiffs until Oct. 14 to submit a 2nd amended complaint against Ferring Pharmaceuticals, though the docket report for the Northern District of Illinois court lists Oct. 18 as the final submission date. Ferring and plaintiffs in the Bravelle class action suit were due to meet this morning at 8:30 a.m. local time for a status hearing on a separate motion filed by plaintiffs back in ­­­­­­­­April. The motion was filed in response to what plaintiffs call “improper and misleading communications” by Ferring. Plaintiffs said Ferring’s reimbursement letter to consumers who purchased Bravelle during the recall period failed to mention that the class action lawsuit had been filed and was pending in court. Plaintiffs also took issue with Ferring’s reimbursement website, which failed to mention the existence of the lawsuit, as well, according to the motion. Ferring denied plaintiffs’ charge, calling their motion an “improper collateral attack” on the company in a response filed May 31. “Upon receipt of the [recall] notice sent to them, Plaintiffs filed a lawsuit lacking any facial plausibility, on behalf of a putative class of consumers who, like Plaintiffs, could obtain relief through the Reimbursement Program without incurring litigation costs. Plaintiffs have asked Judge St. Eve to order Ferring send a court-approved curative notice to any class member who received the reimbursement letter informing members of the class action lawsuit pending in federal court and listing the names and addresses of plaintiffs’ counsel. Ferring argued it should not have to pay for plaintiffs’ attorneys’ “advertisements,” and said plaintiffs rejected the company’s offer to revise the release it sends with its reimbursement checks back in July. The two parties submitted a joint status report to the court last week but said they were “at an impasse” regarding the motion and asked the court to decide. The case is Keith et al v. Ferring Pharmaceuticals Inc. et al. (1:15-cv-10381) in the U.S. District Court for the Northern District of Illinois.